Background: Although internal root resorption does not have etiological agents clarified, it is correlated with infection and physical trauma. Objective: To carry out a literature search of clinical studies to emphasize the main considerations about the use of MTA based cement in internal root resorption endodontics. Methods: Following the criteria of literary search with the use of the Mesh Terms that were cited in the item below on "Search strategies", a total of 36 papers that were submitted to the eligibility analysis were collated and after that, 14 studies were selected, following the rules of systematic review-PRISMA. Major findings: The activity of reabsorption of odontoclasts in cases of IRR causes defects in the intraradicular dental tissue concomitant with the deposition of hard tissue similar to metaplastic bone. As a result, an irregular shape resorption defect occurs in the dentin walls of the affected canal region. Some authors successfully treated perforating cases of internal resorption using MTA and periodontal surgery with graft materials in single treatment sessions. The successful long-term clinical and radiological results of this case favor non-surgical endodontic treatment for cases of internal reabsorption. Thus, the surgical approach in the treatment of perforating internal resorptions can be used when an excessive extrusion of the filling of the MTA occurs during filling of the root canal. Conclusion: Internal root resorption and an injury occurring within the pulp space. Etiology is correlated to trauma, crown preparation or pulpotomies. The differential diagnosis is of fundamental importance, as is the choice of the obturator material in order to proceed with the appropriate treatment. Internal root resorption does not have a fully understood etiology and most authors agree that trauma and infection are the main etiological agents [1,2] it is a pathology that is associated with injuries to the odontoblast layer and pre-dentin. It can be called intracanal reabsorption, odontoblastoma, endontoma or internal granuloma . The causative or etiological factors can vary according to quantity, quality and nature, leading to several types of tooth resorption . In fact, several factors are responsible for internal resorption such as trauma, cavities, periodontal infection, iatrogenic procedures, restorative preparations, orthodontic movements, bruxism, anacoresis and vital pulpotomies. These triggering factors promote an inflammatory process in the pulp space with loss of dentin and cement. Exposure of the mineralized matrix of these tissues triggers the resorptive process by attracting and activating clastic cells (osteoclasts). However, it is necessary that there be a stimulus, since, without it, the clastic activity and resorption [4,5]. As there is no symptomatology, it is diagnosed through routine radiographic examinations, in which a circular radiolucent image is observed that changes the contour of the root canal. It presents as a radiolucent, symmetrical, ovoid or rounded area, well circumscribed, and may involve one or more walls, inside the root canal . When correctly diagnosed, internal root resorption has a favorable prognosis. However, in cases where communication with the external radicular surface occurs, the dental structure becomes weakened, and elimination of the infection may present greater difficulty . In the case of internal inflammatory resorption, endodontic treatment is the first choice, in which all pulp tissue must be removed, as well as granulation . The instrumentation of the root canal of the tooth with internal resorption is challenging, being different from that of the normal endodontic treatment. The treatment is expensive and the prognosis is unpredictable, since the periapical radiographic examination promotes a limited view of the extent of the lesion because it has only two dimensions. The success in the treatment is directly related to the location, size and period between the occurrence and the treatment, as well as the type of obturator material that has important function in the sealing of the perforated area and the biocompatibility with the tissues . In this context, internal root resorption is a rare condition. A portion of the pulp tissue within the root canal exhibits resorptive inflammatory changes involving cells that reabsorb dentin in the resorption lacunae [1,2]. Thus, predentine and odontoblasts were suggested as a protective layer against internal resorption, inhibiting dentin-cell adhesion to dentin tissue [3,4]. If the pulp is not completely necrotic due to the advancement of coronal infection, internal reabsorption progressively reabsorbs the dentin from the root canal and eventually perforates the cement . In this sense, two types of internal resorption were defined based on histological observations as follows: internal inflammatory resorption (IIR) and internal replacement resorption (IRR) . IIR shows a clear oval radiolucent area around the root canal. In cases of IRR, an irregular increase of the root canal with the radiological appearances of a diffuse material similar to the bone tissue can be observed . As a form of treatment in perforating cases of internal root resorption, the mineral trioxide aggregate (MTA) is highlighted to fill root and canal defects. In addition, removal of resorptive inflammatory tissue with surgery and filling of root defect with MTA may be another treatment approach for perforation cases [2,3]. The present study aimed to carry out a literature search of clinical studies to emphasize the main considerations about the use of MTA based cement in internal root resorption endodontic. 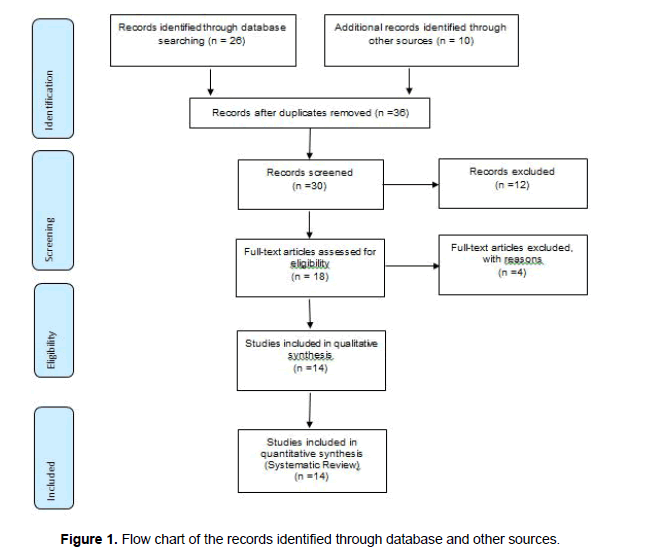 Following the criteria of literary search with the use of the Mesh Terms that were cited in the item below on "Search strategies", a total of 36 papers that were submitted to the eligibility analysis were collated and after that, 14 studies were selected (Figure 1), following the rules of systematic review-PRISMA (Transparent reporting of systematic reviews and meta-analyses-http://www.prisma-statement.org/). Figure 1: Flow chart of the records identified through database and other sources. The review protocol was based on the criteria of literary search with the use of mesh terms in the main databases such as Pubmed, Medline, Bireme, EBSCO, Scielo, etc. In general, as an example, the search strategy in MEDLINE/Pubmed, Web Of Science, ScienceDirect Journals (Elsevier), Scopus (Elsevier), OneFile (Gale) followed the following steps: search for mesh terms: Root resorption, Physical trauma. MTA-Based Cement, use of the bouleanos "and" between mesh terms and "or" among historical findings. The activity of reabsorption of odontoclasts in cases of IRR causes defects in the intraradicular dental tissue concomitant with the deposition of hard tissue similar to metaplastic bone [1-3]. As a result, an irregular shape resorption defect occurs in the dentin walls of the affected canal region [10-12]. In this context, Nilsson et al. suggested the surgical approach with the use of MTA or calcium silicate cements for filling as a second intention in cases where it is not possible to manage the lesion through the canal. Patel et al. observed that the final modality of treatment for the treatment of perforating IR cases is conventional endodontic therapy. Altundasar et al. successfully treated perforating cases of internal resorption using MTA and periodontal surgery with graft materials in single treatment sessions. The successful long-term clinical and radiological results of this case favor non-surgical endodontic treatment for cases of internal reabsorption. Thus, the surgical approach in the treatment of perforating internal resorptions can be used when an excessive extrusion of the filling of the MTA occurs during filling of the root canal. The advantages of long-lasting dressings are the antibacterial effect on intracranial bacteria and their possible necrotizing effect on internal inflammatory resorptive tissue, which is similar to the effect of coagulation necrosis on exposed pulp tissue due to its high pH. However, this long-term medication can cause a significant reduction in fracture resistance of the roots of the teeth [1,2]. Still in this scenario, some disadvantages and advantages stand out. The disadvantages of sputum MTA canal filling in perforating internal resorption cases may be coronary discoloration, perforation extrusion and inadequate marginal adaptation around root defects. The advantages of the MTA are good sealing ability, biocompatibility and physical durability . MTA has been shown to allow the proliferation of periodontal and cementoblast cells over themselves in animal studies and cell culture . The obturation of the canal system is an essential step of the radical endodontic treatment and should be performed in the highest clinical standards, since the objective is to block the communication of microorganisms between the oral cavity and the periapical tissues and eliminate all spaces empty of the interior of the root canal system, to prevent bacterial development and apical periodontitis. In a study carried out at the University of Washington and referred to by Ingle, it was concluded that 60.0% of the failures of root canal treatments were due to poor filling, thus becoming more valuable the canal filling phase . The obturator materials present total importance in the success of the endodontic treatment. Calcium hydroxide, in paste form, prior to insertion of the filler into the cavity, causes disinfection of the site and prevents invagination of the granulation tissue . Calcium hydroxide is a strong base, when associated with different vehicles, stimulates the repair process and promotes the decontamination of the adjacent medium. However, it is a soluble material in the presence of tissue fluids and when used in the treatment of perforations does not result in the formation of a barrier of mineralized tissue . In addition, the sealing ability and biocompatibility of the restorative material is essential, not to be resorbable, noncontaminable by blood, non-toxic and have the ability to induce bone and cement formation . Several materials have been used for the treatment of root perforations and resorptions but currently the most indicated and used is the MTA (Aggregate Trioxide Mineral) . It is an aggregate of mineral trioxides, developed by Mahmoud Torabinejad (University of Loma Linda, California-USA). Date of the 90s, when it was used as an experimental material, in order to seal the communications between the inside and the outside of the tooth. In 1998, the MTAR was evaluated and approved by FDA (U.S. Food and Drugs Administration) and marketed in 1999 as ProRoot MTAR (Dentsply/Tulsa Dental, Oklahoma-USA). This aggregate, which in its initial presentation had a gray color, is presently available in white. According to the manufacturer, it consists of: tricyclic silicate (Ca2 SiO3), calcium silicate (Ca2SiO3), tricyclic aluminate (Ca3Al2O4), tricalcium iron aluminate (Fe2Ca3Al2O4), bismuth oxide (Bi2O3) and calcium sulfate . Studies have shown that MTA can induce repair in the periapical tissues and that it presents excellent sealing and mechanical capacity, even in contact with moisture, characterizing itself with a good apical sealant material [1-3]. Such properties are interesting considering the buccal conditions of humidity and temperature . Depending on the location of the resorption, forced orthodontic extrusion will be another possible clinical procedure, since it will expose the lesion and thus the repair treatment will be carried out . Internal root resorption and an injury occurring within the pulp space. It’s supposed etiology is correlated to trauma, crown preparation or pulpotomies. The differential diagnosis is of fundamental importance, as the choice of the obturator material in order to proceed with the appropriate treatment. I thank Professor Dr. Arnaldo Sant'anna Junior for the opportunity to add knowledge to my professional career. Subay RK, Subay MO, Tuzcu SB. Endodontic management of root perforating internal replacement resorption. Eur J Dent. 2018;12:450-453. Eren KS, Aksel H, Ors AS, Serper A, Kocak Y, et al. Obturation quality of calcium silicate-based cements placed with different techniques in teeth with perforating internal root resorption: a micro-computed tomographic study. Clin Oral Investig. 2018. Souza BDM, Dutra KL, Kuntze MM, Bortoluzzi EA, Flores-Mir C, et al. Incidence of Root Resorption after the Replantation of Avulsed Teeth: A Meta-analysis. J Endod. 2018;44:1216-1227. Prata MIA, Villa N, Rodrigues HA, Cardoso RJA. Evaluation of external and internal apical radial reabsorption in teeth with periapical lesions. JBE, Curitiba. 3:10:222-228. Verde S. Clinical Applications of Calcium Hydroxide in Endodontic Therapy. J Endodont Prac. 1:52-69. Barbosa SV. Endodontic Therapy. Sao Paulo: Santos. 1999;pp:254-256. Lopes HP, Rocas IN, Siqueira JR. Dental resorption. Am Assoc Endodont 2012. Guimaraes-Pinto S, Trope MR. Luxation injuries and external root resorption-etiology, treatment, and prognosis. J California Dent Assoc. 2000. Neto M, Karla SF, Magnabosco, Claudio MP, Luis AF, et al. Use of MTA-based cement in the treatment of root perforation: clinical case report. 2012. Ferreira MM, Leitao J, Carrilho EVP. Internal Radicular Resorption. Portuguese Journal of Stomatology, Dental Medicine and Maxillofacial Surgery. 2007;48. Marcos J, Pappen FG, Lima RKP. MTA obturation associated with parendodontic surgery in external apical root resorption retreatment-case report. 2008. Patel S, Ricucci D, Durak C, Tay F. Internal root resorption: A review. J Endod. 2010;36:1107-1121. Nilsson E, Bonte E, Bayet F, Lasfargues JJ. Management of internal root resorption on permanent teeth. Int J Dent. 2013. Altundasar E, Demir B. Management of a perforating internal resorptive defect with mineral trioxide aggregate: A case report. J Endod. 2009;35:1441-1444.